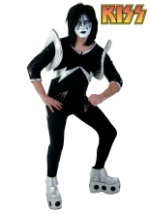 Transform into a legendary member of KISS with this authentic Gene Simmons costume. The officially licensed KISS Costume is inspired from the band's Rock the Nation tour in 2004 and is made of high-quality material while featuring elaborate detail. The base of the realistic outfit starts with the bodysuit, which has stretchy material comprising of 83% nylon and 17% spandex as well as pleather with large metal silver stud detailing. A deep v-cut is located in the chest for easy access while black elastic stirrups attach to the ankles. The sides of the legs have a large triangular openings trimmed with black leather and large silver studs, which is also repeated in the inner thighs. The elaborate vest fits over your head and has attached wings with comfortable elastic on the underside to slip your arms through. The top of the arms and the shoulders are lined with silver spikes that are made of soft, shiny fabric. The front cod piece comes with stud detailing and attaches to the vest with plastic fasteners and to the back cod piece with Velcro and silver rings. In addition, a choker with silver square studs and stretchy black, fingerless gloves are also included. 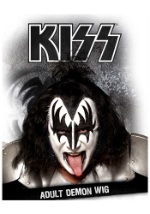 Showoff what kind of Kiss fan you truly are with this authentic Gene Simmons costume.